When you use your bicycle for transportation you need to keep it safe at your destination so that it’s there when you want to ride back. It is important to know the following tips to protect your bike from theft and keep it secure. Of all the accessories you buy for your bicycle, a good lock is the most important. Although no lock is completely secure, it is better to buy the best lock you can afford, as a lock is always cheaper than buying a new bike. In general, a sturdy U-lock is best compared to cable and chain locks because they are relatively easy to cut through. If parking on the street, you want to make sure that all parts of your bike are locked to a fixed object like a bike rack in a publicly visible location. Or you can choose more secure bike parking options such as a bike locker or Metro Bike Hub . Bicycle racks come in many different shapes and sizes. Position your bike in a manner that makes it easy for other people to lock their bike to the rack. Anything that can be easily removed on your bike may be subject to theft and you would want to lock it to the racks. Rear wheel is typically more valuable and expensive to replace, so if you only have one lock, use a U-lock to lock the frame and rear wheel to the rack. More ideally, you would want to use two locks (two U-locks or a U-lock complemented by a cable lock) to secure both wheels and the frame to the rack. If you have a quick release on your front wheel, consider removing the front wheel and locking it with the rear wheel and the frame. Also consider registering your bike with the local police department to facilitate recovery in case your bike is stolen. Metro bicycle lockers are secure enclosures to allow the storage of one bicycle of typical size and form. They are more secure than bike racks and can shield the bicycles from the elements to a certain degree. 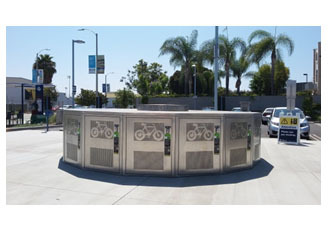 Bike lockers are available for rent at several Metro Rail and Busway stations. To check locker availability, apply to rent a locker, or to manage your bike locker rental, visit the Metro Bike Locker Registration page . Certain Metrolink stations also offer bicycle lockers. They are operated by the cities where the station is located. Metro does not operate them. To inquire about lockers at Metrolink stations, please contact the local cities. Metro Bike Hubs are bike stations that offer secure, high-capacity bike parking, provide weather protection, and include security features such as controlled access for members only and CCTV. This type of secure bike parking facilities provides an easy and safe way to park your bicycle, get accessories, and access repair services. 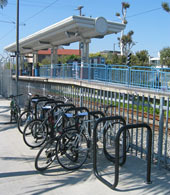 Metro currently operates Bike Hubs at El Monte Bus Station, Hollywood/Vine Red Line Station, and Union Station. Pricing ranges from $5 for a 7-day Pass to $60 for 1-Year Pass. To learn more and register online for a membership, visit Metro’s Bike Hub website . Similar facilities also exist in Burbank , Covina , Long Beach , and Santa Monica . When using your bike to access transit, DO NOT lock your bike to station railings or furnishings, since this blocks access to the station and will be subject to removal. Be wary of locking your bike to fences or railings on private property, as property owners may remove your bicycle. 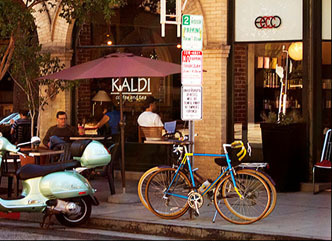 Most cities do not have clear rules about whether or not you can park your bike at street signs or parking meters when a bike rack is not available. Typically, street signs are OK but be wary about parking at parking meters. Always check and follow the local regulations and signs at your location, if present.